Conservatism is the ideology of governmental, cultural, and economic order, tradition, hierarchy, and authority that comes in classical, social, and economic forms. Conservatism comes in many forms, all of which are generally considered “right-wing.” Its opposition philosophy is liberalism. Politically, conservatism is about keeping order, like a traditional, authoritative, and hierarchal Monarchy/Aristocracy. Thus, we can see conservatism is generally an ideology focused on cultural, and economic order, tradition, hierarchy, and authority. 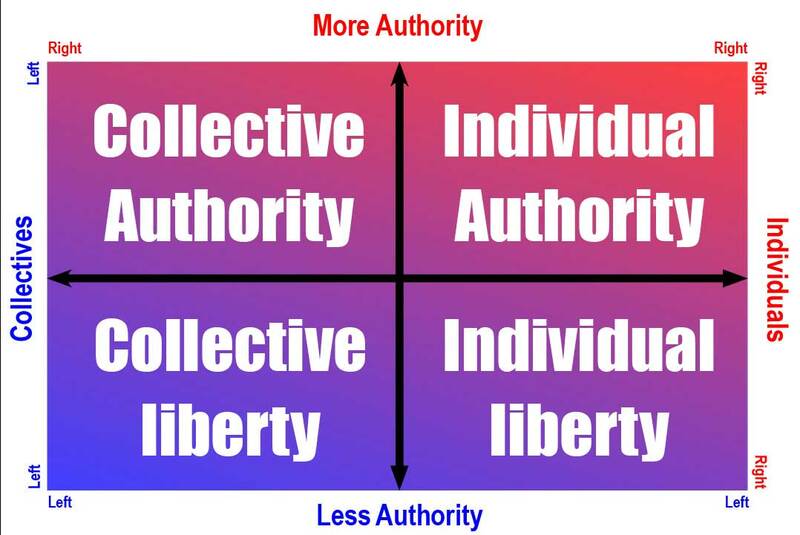 In its classical form (classical conservatism) it focuses on authority and order through traditional/classical power structures like the church and state (it favors authority of the few or one, and not individual liberty of the many). In its social form (social conservatism) it favors social hierarchy and tradition, and not social equality. It often arises as a rejection progressive social liberalism, but not always. It generally wants to progress rapidly toward traditional values and tends to be more liberal and populist than the more aristocratic classical conservatism. Economically, classical conservatism generally favors state controlled economies and protectionism (a protectionist mercantile economy run by the state). Meanwhile, social conservatism generally favors free-markets mixed with protectionism (for example rejecting globalism and favoring the native population). Very different from both of the aforementioned is fiscal conservatism. Fiscal conservatism is only loosely related to general classical and social conservatism, it is literally “being conservative economically” and would involve mitigating risks and paying down debts. FACT: Conservatism came from the Enlightenment thinkers, although we can trace the history of conservatism back as far as we can trace the history of Monarchies, it begins in its modern form in the writings of figures like Robert Filmer and Thomas Hobbes who supported “the absolute right” of kings. TIP: We focus on American conservatism here. It is closely related to conservatism as a general concept and western conservatism, but isn’t the same in all cases. Classical conservatism and social conservatism are, in many ways, the antithesis of classical liberalism and social liberalism respectively. 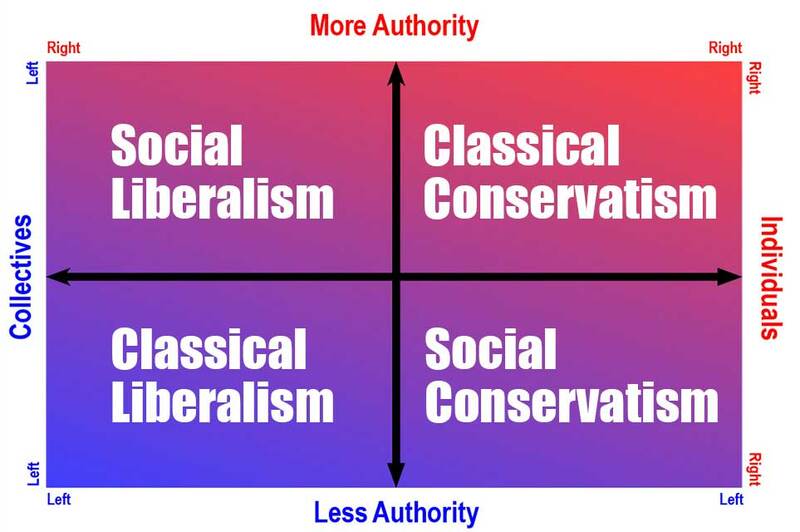 TIP: As you can get a sense of from the above chart, in terms of classical forms of governments: Conservatism is the ideology of Monarchies, and Liberalism is the ideology of Democracies (meanwhile, the ideal mixed-republic‘s ideology is somewhere in the middle.) Likewise, in terms of their social forms, social conservatism is the ideology of social hierarchy and nativism and social liberalism is the ideology of egalitarianism and inclusion. A person may be inclined toward any ideology due to their personal tastes, but generally speaking they are all valid and naturally occurring pieces of the same puzzle meant to temper each other. Examples of Classical Conservative Values: Economic planning, state-based trade, social and class-based hierarchy, no individual property rights, state-based religion, protectionist, nationalist, no separation of church and state, limited freedom of speech, limited freedom of assembly, no right to a fair trial. They stand against Human Rights not found essential to the state or social structure. From the traditional structure of governing entities from families to kingdoms to the rejection of liberalism to Gilded Age Cronyism and Monopolization. See James VI and Thomas Hobbes, and most governments, businesses, churches, and families in the history of mankind. NOTE: The ends are order, hierarchy, and tradition by means of authority. Like the father protects his children, or the Monarch protects the citizens, the classical conservative is the archetype of a patriarch. If the restraints used are seen as necessary, but judged “negatively” by the other members of the family when they limit equality and liberty, that is opinion, not specifically a statement on the effectiveness of the families rules in-action. Examples of Social Conservative Values. Restrictions on immigration, A pushback against the social programs (of all types), decentralization of the federal policy, restoration of controls upon free trade, greater emphasis upon nationalism and isolationism, pro social hierarchy in terms of gender, ethnicity, and race. They stand against “big government” (the are anti-social liberalism). Their ideology is well expressed by what liberals lovingly call “the Vast right-wing conspiracy“, a marriage of all the minority social conservative movements from John Birch, to big industry polluters; to evangelical movements; etc (AKA movements that pushback against social liberalism). From the rejection of social liberalism to The Conservative Coalition. See The Civil War, the Gilded Age, Harding, Coolidge, and Hoover and the Anti-New Deal movement, States’ Rights Socially Conservative South, Goldwater Republicans, Fox News, Talk Radio, and the Southern Strategy. NOTE: The modern conservative Republican party has a populist social conservative wing, well illustrated by the Tea Party. The other wing, the establishment wing we call neocon, is the classical conservative “pro-business” wing. Like establishment neoliberals and populist social progressives, each major faction shares goals and general ideology. Above we covered the basics, below we return to each aspect of conservatism to offer more detail. Conservatism is the political ideology of order, tradition, hierarchy, and authority, where classical conservatism emphasizes state authority and aristocratic hierarchy over individual liberty, and social conservatism emphasizes social order, tradition, and hierarchy over social equality. TIP: Social conservatism is closely related to Paleoconservatism, but it is not “the same” as “Fascism” (although the two ideologies do share some planks). TIP: Liberalism, the ideology of liberty and equality, is the opposition philosophy to conservatism. From this frame of reference, as an opposition philosophy, conservatism is all about pushing back against modernization and trying to make things “Great Again.” Or in other terms, it is a pushback against excesses of liberty and equality. In this way, as liberalism arises when pushing back against the state, conservatism pushes back against liberalism (especially progressive social liberalism). See Understanding liberalism and conservatism for a comparison. TIP: Both liberalism and Conservatism, in their enlightened forms, seek to use reason to seek just ends. However where liberalism favors: the principles of democracy, republicanism, separation of powers, popular sovereignty, free speech, free trade, freedom of religion, and other general ideologies that favor human rights and the liberties and the well being of individuals and groups. Conservatism favors the opposite in most cases, it favors: the principles of aristocracy, authority, central power, absolutism, censorship, protectionism, state-based religions, and other ideologies that favor social hierarchy and authority over individuals. This is complicated by the social and classical forms of each. TIP: One should think of American Conservatism as a conservative form of liberalism. Most Americans aren’t true classical conservatives who truly oppose all the planks of classical liberalism. 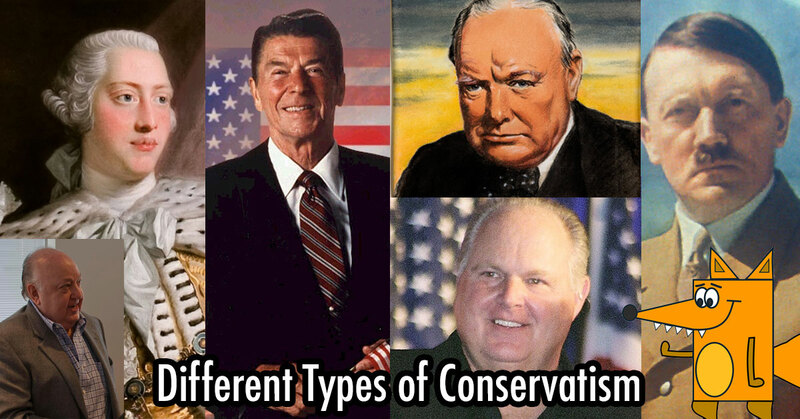 TIP: Conservatism as a broad concept shouldn’t be confused with American “Right Wing” “Republican Party” Conservatism. Like American “Left Wing” “Democratic Party” Liberalism, American Conservatism is unique. Understanding the foundation of liberalism and conservatism will help you understand its many forms. See American “Left Wing” Liberalism and American “Right Wing” Conservatism and Liberalism and Conservatism. Social conservatism is “to the left” of the classical form on matters of authority and typically “to the right” on social issues. They are both generally “to the right” of liberalism socially but on some issues “big government” liberalism can be “to the right” regarding authority. People can and often do have “mixed” political views that differ issue-to-issue. Conservatism is the economic ideology that favors order, tradition, hierarchy, and authority in the markets. Classical conservative economics (like Mercantilism) favors state control of economics. Socially conservative economics (like Trickle Down Supply Side) supports a top-down and otherwise individual guided economy with limited or no safety net meant to ensure conservative values. It is similar to, but isn’t the same as classical liberal economics; it is similar in deregulation, but different as its ends are socially conservative not liberty-minded liberal ones. Both these ideologies favor protectionist trade policies, but the social conservatives tend to reject economic globalization more than classical conservatives due to its social connotations. Further, fiscal conservatism means “to spend conservatively.” It is the opposite of fiscal liberalism. This point should not be confused with how we use any of these terms in practice. No modern political party creates a surplus in practice, so all are economically liberal and none are fiscally conservative as an absolute. Each comes in a conservative, moderate, and radical form. Each may have its own stances on economic and social issues. Some on the far-right favor very small government, some favor government when it suits them, some favor big “conservative” government. Within any ideology, especially when we just consider two groups like “liberal and conservative,” there are going to be many different belief systems. In American politics now, there is a big difference between the Freedom Caucus, Establishment House Republicans like Paul Ryan, and Senate Republicans like John McCain, Rand Paul, and Ted Cruz. TIP: In America, the two general types of conservatives are neocons and Tea Party Populists. I could go into mind-numbing details about different factions, but the general populist establishment works for both the left and right by creating our four basic forms, two classical and two social. TIP: Libertarians sometimes exist under this big tent, but they are their own entity. I’ll aim to make a page for them. They are both classically liberal and classically conservative. Conservatism, in all its forms, is the ideology of order, tradition, hierarchy, and authority (just as Monarchy/Aristocracy is the form of government with these ideals). Classical conservatism in any form stands against individual liberty and for order, authority, hierarchy, and tradition (against classical liberalism). Social conservatism in any form favors some forms of social inequality and otherwise stands for individual liberty even if it means social inequality. Social liberalism stands against that. Here we should note that social conservatism is often very classically liberal in practice, so just as social liberalism uses authority despite its liberal roots, social conservatism uses limited government and deregulation. Taking two steps toward an ideal is more complex than one, so the social forms of liberalism and conservatism are both more complex and “mixed” than the classical forms. With all of that noted, liberalism and conservatism aren’t either/or choices. In fact, I would propose to you that the answer is somewhere in the middle (as is expressed by conservatism as a general concept; which is mean to be temper, but not oppress, liberalism classically speaking, as one can see visually in the table below). Classical, traditional conservatism is the original type of government and family style that most countries had as their primary form of government in Western history and history in general. There were oligarchies and timocracies like Sparta. There were more democratic systems like Athens. There were Republics like Rome. Most city-states or nation-states had Kings, Religions, and limited freedoms, and they were lucky if they had a Monarch rather than a Despotic Tyrant. Then, at a few amazing points in history, our ancestors broke us away from the traditional order and gave us a taste of freedom and equality, and the taste was sweet. Some liked the equality taste better; some liked the liberty flavor. Without the traditional restraints of the state, there was war. War wasn’t a matter of Kings playing chess for territory or wealth, but the war over social ideologies fueled by the rage of populist factions. We can see this in the uprising of Julius Caesar or Napoleon, and in the Civil War, WWI, and WWII. Call them Plebs and Patricians, Union and Confederate, or call them Communists and Fascists if that makes it easy for you to see the analogy. By any name, the phenomena are the same. We have two groups who don’t agree, the left and right. In a liberal nation, with social aspects considered, we can denote them as four types in terms of left-right and populism like this: establishment left, populist left, establishment right, and populist right. Where we might call them neoliberals (social liberal, classical liberal, and classical conservative establishment), progressives (social liberal, classical liberal, and classical conservative populists), neoconservative (social conservative, classical liberal, and classical conservative establishment), and Tea Party (social conservative, classical liberal, and classical conservative populists) in America today. Or we might use different terms, the general concept is the same. Or we can denote them simply by the four classical and social forms of liberalism and conservatism. From any perspective, the idea is that we can break down liberalism and conservatism into a few basic flavors to better understand some core naturally arising political dualities of any era. TIP: The left-right images below show that the types we are talking about span a few different parts of a political spectrum with exact stances differing by issue. The “Socially Conservative” Tea Party is socially conservative on many issues, and that is left-right, but its specific uses of state power and classical conservatism make it more complex in theory than it is “socially conservative” in practice. The following two charts should help give a visual of that. Here is a basic version of a left-right spectrum chart. In the Civil War, WWI, and WWII not only the elite left and right, but the socially populist left and right fought over ideology too! That may not seem notable, but it is historical. These forces exist in full form today thanks to a liberal environment that allows it. A despot never allows four forces to exist in balance in any natural form; tyranny can’t tolerate such liberties. The forces have always existed as aspects of the human condition as it relates to possible stances on politics. To avoid confusion, I won’t review conservatism from Solon to Plato, to Rome, to the Italian Trading Republics, to the reactions to the rise of modern banking, or to conservatism in the Atlantic trades. Instead, let’s start with modern history. In some respects, we can say modern conservatism began in the mid-1600’s with the father of Liberalism John Locke defining the liberalism that would remove Kings as the ruling power of England and replace them with a more popular government. Maybe we can say “it Starts with Thomas Hobbes poking fun at Cromwell’s revolution and civil war and pleading for tradition and order, even if it meant the absolute right of kings.” That is perhaps a better starting point as “what is classical conservatism” but can anyone accept the ideology of an absolute King? Meanwhile, social conservatism began in earnest in the mid-1800’s as a response to figures like Lincoln and Marx and the push for equality over the inequality of the Gilded Age. There had always been witch trials and Spanish Inquisition and inquisition myths, but again to start the story from Hobbes on, social conservatism in its modern form begins to arise as a movement in the mid-1800’s to oppose progressive social liberalism. If you stood with the Confederates in the Civil War or the Fascists in the World Wars, or to some extent with a figure like Cromwell, you were generally part of the populist right socially conservative movement of the day. On the other hand, if you stood with Washington, or Adams, or Eisenhower, or Churchill, or Truman… or even King George III and his Kingsmen… you were classically conservative. If you stood with the Barons of industry, Hoover, or Goldwater, you were somewhere in between. When one stands with traditional powers against radical change, that is conservative. When one resists social progress specifically, and calls for regression toward traditional values, that becomes socially conservative. Here one can note that the Civil War was largely a battle between Classical Conservative and Socially Liberal Federalists and Social Conservative and Classically Liberal Anti-Federalists. This four way split is vital to understand due to the way conservatism over-laps with liberalism in its different forms. TIP: Below I discuss the history, merits, and vices of social conservatism in its modern radical form. I won’t be putting lipstick on a Fox, but you should note I am not trying to delegitimize the underlying merits of conservatism. Instead, you’ll note that I defend conservatism in all its forms, within the bounds of reason. When I discuss liberalism I do not sugar coat its relation to Marx in extremes, likewise when I discuss conservatism one should not expect me to sugar coat the Confederate South or Mussolini in their extremes. In public no one wants to stand with Hitler, but in WW2 Hitler led an army that conquered parts of the world. We might not want to identify as social conservative in polite company, but it is a fact of life that this dominate right-wing populist ideology is a force (likewise no one looks back at the liberal revolutions and says “I would have sided with the King”…. but of course people did). I would just say, if you note our left-right models, you can see we obviously value all types, but reject ideologies of extremes just as Plato or any other great philosopher would. One way to understand social conservatism specifically is to understand the Civil Rights era in America. As in that era the social conservative south broke away from the liberal democrats (who were shifting toward progressivism) and joined the classically conservative republican party. This helps to illustrate the mixed left-right nature of social conservatism and the version of center right classical conservatism we might call liberal-conservatism too (those being terms which describe the two main Tea Party and Neocon wings of the modern Republican party). In 1964 LBJ signed the Civil Rights Act and the Social Conservatives in the south began to switch over to the Republican party. Part of this “vast right-wing strategy” was aimed at the south, but more so it was aimed at scattered social conservative factions, a faction such as that represented by the “John Birch Society” in 1900 as a response to the progressiveness of the 20th century. The John Birch Society was emblematic of the unified reaction to progressivism caused by a number of single voter issues. Socially conservative factions were in both parties prior to the latter half of the 20th century. This wasn’t so different from the Young America movement or the Confederates. They both wanted to return to a past time. It also wasn’t so different from the Fascists who some right-wing Americans supported over our ally Stalin. In the 1930’s – 2000’s Conservative Coalition, no single voter issue socially conservative faction was strong enough on its own, but together, under a strategically planned big tent, they could create a Frankenstein’s monster of sorts. I’m making a reference to the populist Jacobins of the French Revolution, as done in the Frankenstein book; it is an underhanded compliment and metaphor, not an insult. The Powell memo, the southern strategy, the John Birch Society, the repeal of the Fairness Doctrine, Goldwater, Nixon, Reagan, Norquist, Roger Ailes, Lee Atwater, Karl Rove, Frank Luntz, Fox News, Reagan, Right-Wing Radio, Alex Jones, and Rush Limbaugh. There was “a vast right-wing conspiracy” aimed at using questionable tactics to get the many different social conservative factions to buy into each other’s ideology. Each one was not popular enough on their own, but in a “big tent” they became a force. Essentially, the Conservative Coalition in their fight against Communism and liberal Democrats since WWI, but especially when their hand was forced post-1965, created the modern right-wing political machine (the alt-right, Tea Party National Populists, or whatever you want to call them). This machine is part self-interest and part coordination; we talk about it in detail here if you want the details. Suffice to say, the overarching strategy didn’t just go after Southern Socially Conservative Democrats and thus cause “the Solid South Switch,” but it also went after working-class Democrats and moderate Republicans. In other words, the complex actions of the sixth party conservatives in both parties “switched” some to the Republican Party, but also switched the party from Federalist-leaning to Anti-Federalist (so to speak). In simple terms, “the parties switched.” There was a big switch in the 20th century, and a few other notable ones before that. We could talk about Clinton’s reaction to this “vast right-wing conspiracy,” but, despite its relevance, it is a bit off subject This is a page about conservatism; although please note that Bill Clinton was called a Reagan Liberal or Third Way Conservative Liberal. Likewise, not everyone in the party, not everyone in that big tent is “in on it” or is equally as radical. Just as not every Democrat is Bernie, not every Republican is Ted Cruz. TIP: The video below helps explain Fox News’ point of view. Part of it is a reaction to the progressivism of the 20th century. The more valid concerns aren’t always noted in the documentary. With that said, if you don’t understand the start of the post-fairness doctrine major media propaganda war, then it is hard to understand modern right-wing conservatism in action (or the progressive liberal left in action for that matter). The Brainwashing of My Dad Trailer. Like Outfoxed, this movie explains the Republican political machine that took over America. What this fails to do is humanize the social conservative right. We have to understand, that social conservatism is real and valid, but that in response to Civil Rights and the rise of Progressivism over the course of the 1900’s, the right-wing overreacted and employed the propaganda techniques of the fascists to try to mobilize a pro-business right against Communism. That may have been well intentioned, but the ramifications are so ironically Jacobin and Marxist it is a little scary. It needs to be emphasized until the establishment wing reigns back in their hounds. Fascism isn’t the answer to Communism; liberalism is the answer to both. That is what American Republicanism, Democracy, and Federalism and real law and order are about. Oddly, Trump is probably our only hope aside from the few centered-right figures like Kasich, Graham, McCain, and sometime Pence. Although I have odd hope for Bannon and institutions like Cato, smart people like Mnuchin and Tillerson. The right has a foot in the water, but they haven’t fully plunged in yet. Can Frankenstein’s monster be stopped, or wait, was the angry lynch mob with torches the actual monster? Either way, Frankenstein as a political metaphor works here. It is helpful to see the left and right, populist or elite, are naturally occurring social systems where conservative is just a natural stance on any single voter issue. In a country where things are progressing forward toward a socially left system, it is natural that conservative groups would form and strategize in resistance. Although social conservatism will always have a natural validity and a seat at the table of human sentiment, it doesn’t excuse any complexities in action (especially the unnatural aspects like the use of propaganda). Just like if Communism were rising in the west, we would be right to be concerned despite the fact it is natural for many to be compassionate and want equality, with social conservatism rising in response to globalization, we have to be concerned. Not because it is unnatural, but because it is a natural response that can have some nasty effects in extremes. In modern times we can see a type of populist conservatism not so unlike that Big Tent coalition gaining ground globally with Le Pen and Brexit. This natural response can look democratic, but in the extreme, it can look like Hitler (who was responding to the inequality of the global elite after WWI). Social conservatism is legitimate at its core, and in its non-aggressive form is a necessary aspect of the human condition. However, in its dangerously aggressive form, it fights against what it perceives as the Communist left, “the others.” It doing this it threatens: Classical Liberalism, Classical Conservatism, and especially Social Liberalism. Just as too much progress too fast threatens some, an equal and opposite pushback threatens others. Some Social Conservatives may be afraid of the Communists (where they act as an opposition to Left-wing Despotism), but the lesson from WWII isn’t just about Communists (in fact we allied with the Communists to win the war) the lesson is also about the dangers of Fascism. Fascism is a socially conservative ideology, and itself can be despotic when it becomes aggressive and authoritative. When we hear alt-facts like “the south didn’t switch” or “Hitler was a socialist” or “taxation is theft” it isn’t always just fun and games or mistakes, it can be more a coordinated campaign to radicalize the west against the progressive left. The problem with socially conservative (and on the other side socially liberal) factions banding together is that they begin to create global enemies out of two naturally occurring positions. As we realized in WWII, centered democratic liberalism isn’t the enemy, the radicalized extreme left and right are… and this is why a coordinated strategy to radicalize the left or right is on-paper disturbing and in action corrosive. 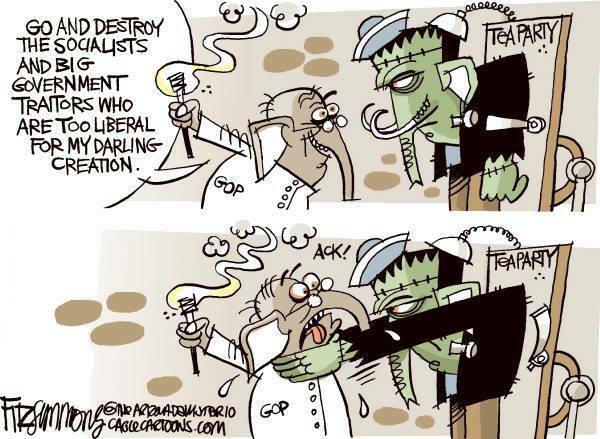 A visual of how the neocons created the Tea Party via entities like Fox News to fight Communism. Look, we all get a chuckle out of the second frame, but the first frame was radically irresponsible. I feel like the average real conservative can’t possibly actually want the Marxist revolution that we today call National Populism? I know it was part of the strategy ideologically, but look at it in practice. Traditional liberal-conservatives who rely on the state to fund things like the military should realize they are the first target. Someone, call George Washington. If he is busy try George III. Churchill would be ashamed of this Jacobin mob. This doesn’t feel like a Second America Revolution, it feels like aggression. It seems like what is wrong with Communism (despotism and tyranny) minus aspects of the economic system. In summary: Social conservatism is like all the other ideologies, good in moderation. We don’t want kings, and we don’t want communism, so why would fascism be OK? Ultimately America fought against fascism. We should all remember that before choosing sides. The term absurd comes to mind. So conclude with a reaffirmation of the types of conservatism. Traditional Conservatives: The ideology of order and tradition, not to have dominion over man, but to maximize justice, order, wealth, liberty, equality, and the general virtues of the State. These are figures like Washington, or Adams, or Eisenhower, or Churchill, or Truman. This is the type that has been around forever. It is liberal-conservative. This is what many conservatives see themselves as. You may think I’m harsh given my thoughts on the vast right-wing conspiracy, but one should consider that stance also expresses frustration with a lack of Eisenhowers and Washingtons standing up for Truth, Justice, Liberty, and Americanism. Tories and Redcoats: Despite their conservative and liberal political views, America’s founders were ultimately Patriot liberals fighting for liberalism and the Tories and Loyalists were the conservative armies of King George III. Decedents of all these factions fought against fascism in WWII. Federalists, Whigs, and Pre-Gilded Age Republicans: These were traditional conservatives, they were socially liberal. They were not populist liberal Democrats like Jefferson, they were Whiggish fellas like Hamilton when it came to business, but certainly socially for equality. These types of conservatives are often found in the Democratic Party today. Neocons: What we can call the business wing of the modern American right. To the extent they ally with social conservatives on social issues, they are socially conservative. Tea Party Populists: The progressively socially conservative big tent of ideologies. This ranges from moderates who identify with other conservative ideologies to radical ideologies that want far-right policies. The Religious Right: Many on the right are more religious than political. They are classically conservative in wanting order and tradition. They are one of the most traditional right-wing groups in this respect. However, a part of the religious right is more than this; they are part of the groups that got organized by the social conservative strategy. Thus, now we have some radicalized evangelic religious groups that are conflating the church and state, and the Republican playbook and Bible while seeking religious national and state policies. Remember that there is a classically religious right and a modern social conservative religious right. This is particularly relevant in America. Here we should keep liberal Christians’ agendas in mind. The push and pull between religion and politics go back some time. I suggest looking into the tension between Protestantism and Catholicism although it is unrelated. General Social Conservatives: These are people who favor tradition and order but don’t want to aggressively follow the progressively socially conservative Tea Party. Most religious families and traditional families who identify with the right-wing are in this group. These are the people who become radicalized by Roger Ailes and his propagandists and turned into Tea Party activists. Fiscal Conservatives: Those who are just economically conservative.